Warren Buffett opened his shareholder meeting Saturday with a vigorous defense of the mobile-home business that he’s helped build into the industry’s most dominant player. OMAHA, Neb. — Warren Buffett opened his shareholder meeting Saturday with a vigorous defense of the mobile-home business that he’s helped build into the industry’s most dominant player. Clayton Homes was the subject of a recent investigation by The Seattle Times and The Center for Public Integrity (CPI), which documented how the company has used predatory sales practices, exorbitant fees and home-loan interest rates that can exceed 15 percent. Because Clayton’s mobile homes often dwindle in value, borrowers find themselves trapped, unable to sell or refinance due to the punishing lending terms. The first question Buffett faced at his annual meeting came from a longtime shareholder in Texas who said he was having “heartburn” about issues raised in the story. The shareholder said he previously viewed Berkshire Hathaway as “an ethical company” but was concerned about Clayton and the company’s weak response to the Times/CPI story. Buffett responded that the company has been exemplary in providing loans to people who often have poor credit. He said the company has no interest in providing loans that fail, since the company holds the loans on its books. 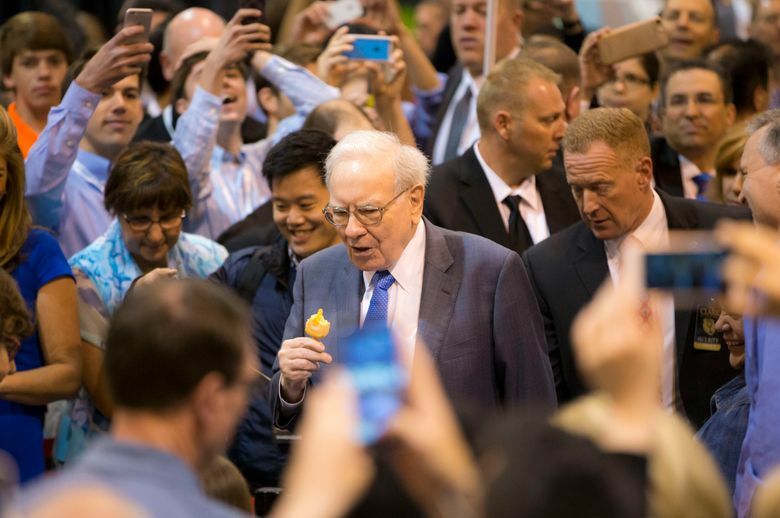 “I make no apologies whatsoever about Clayton’s lending terms,” Buffett told the crowd of 40,000 that gathered in Omaha. Most Clayton mobile-home loans are considered “higher-priced” under federal guidelines, and those loans averaged 7 percentage points higher than a typical home loan in 2013, compared with just 3.8 percentage points for other industry lenders, according to an analysis of federal data. Clayton manufactures the homes, sells them at its retail outlets and finances them. While some borrowers have come to view the integration as a way to steer them into Clayton’s costly loan products, Buffett disputed that. He displayed for shareholders a document that prospective borrowers receive, listing some lending options available. What he didn’t describe was that Clayton lots are often filled with enormous banners and advertisements touting Clayton’s lending products. The Times/CPI story also documented how dealers had financial incentives in years past to get borrowers in Clayton loans, and one dealer described how his superior at Clayton pushed him to put at least 80 percent of buyers in Clayton loans. Buffett said the company has a default rate of just 3 percent “in a year,” which the company later explained was based on a calculation of the total number of defaults divided by the number of loans still on the company’s books. But that method doesn’t reflect the total default rate that occurs in loan pools over the course of time — a cumulative number that would better show the likelihood of a new borrower getting a loan that will fail. For example, another mobile-home lender, Origen Financial, had a pool of loans originated in 2007 that over the next eight years had an annualized default rate often below 4 percent. That loan pool’s “cumulative default” rate over eight years topped 20 percent, according to Origen’s public financial disclosures. Kenneth Rishel, an industry consultant for 40 years, has said the industrywide failure rate on nonmortgage mobile-home loans is 28 percent. Citing his own research and conversations with Clayton executives, he said Clayton’s two lenders have failure rates of 33 percent and 26 percent. Clayton has said those numbers are inaccurate but declined to discuss details. Buffett also disputed a sentence in the story that cited an affidavit explaining the company’s profit on sales in Arkansas. He noted that the numbers cited in the affidavit were “gross profit” and that it was wrong not to provide the “net profit” after expenses and taxes. Earlier in the day, in a brief exchange with Buffett before the event, this reporter asked the billionaire to discuss issues at Clayton. Buffett immediately replied by asking if he and the other reporter on the Clayton story were “roommates.” The reporters have never been roommates. Buffett then asked whether the reporter at Saturday’s event has a sister who works as a lawyer. This reporter has no sister who is a lawyer, but co-writer Daniel Wagner has a sister who works as an attorney at a nonprofit law firm in West Virginia that has brought suits on behalf of low-income borrowers against most major home-loan lenders, including Clayton. Wagner has reported on consumer finance for a decade and was one of the lead Associated Press journalists covering the 2008 financial crisis. Buffett’s Berkshire Hathaway purchased Clayton Homes in 2003. It now constructs nearly half the industry’s new homes and finances more mobile-home purchases than any other lender by a factor of six. Last year, Clayton earned $558 million before taxes.